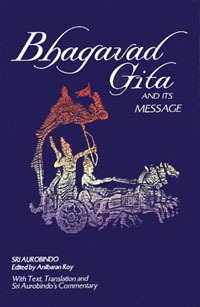 The Bhagavad Gita is one of the most revered texts from the spiritual tradition of India. It is read and studied by millions of people worldwide for its insight and practical orientation toward living a meaningful and significant life. The Bhagavad Gita is not a religious text, but more a textbook of applied yoga and spirituality. The philosophy and teaching of the Bhagavad Gita is timeless and transcends any one place or circumstance. Meetings will take place twice a month on the 2nd and 4th Wednesday of each month starting with November 9, 2005, starting at 7:00 pm. Classes will be 1-1 ½ hours in length depending on the subject of the week and the schedules of the actual participants. We will be using the textbook Bhagavad Gita and Its Message by Sri Aurobindo and copies will be available for participants to borrow or purchase. We expect to complete our study of the Bhagavad Gita in 18 sessions over the next 9 months. Each session will be self-standing so if you cannot attend all sessions you will still find benefit from those you can attend. Recitation or chanting in Sanskrit of portions of the text may take place from time to time. Participants will also have access to our extensive library of spiritual and health literature. 7:00 pm, 2nd and 4th Wednesdays of each month starting November 9, 2005. Please let us know if you are interested so we can have an idea of the size of class and number of books required. Attendance is at no charge. Be sure to call in advance to ensure that there has not been any change in plans at the last minute.